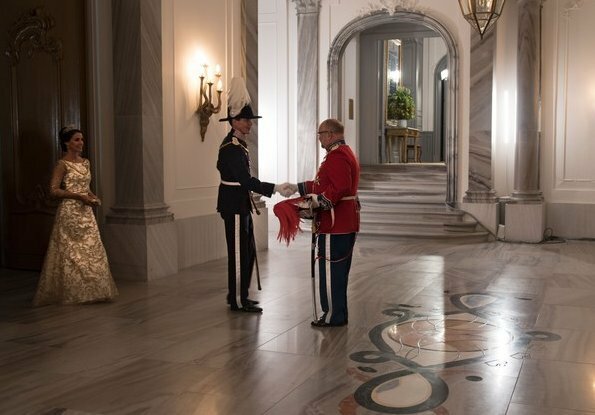 In the evening of January 1, 2018, members of Danish royal family attended the traditional New Year’s Levee and Banquet which is the first reception of the year held for the government and high-level officers. Queen Margrethe hosted the reception at Amalienborg, Christian VII's Palace. 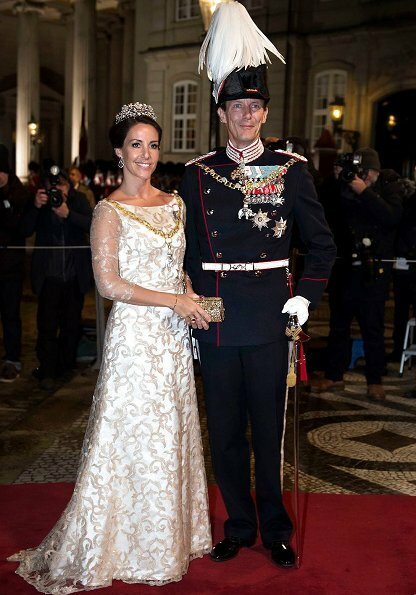 Queen Margrethe, Crown Prince Frederik, Crown Princess Mary, Prince Joachim, Princess Marie and Princess Elisabeth were present at the reception. 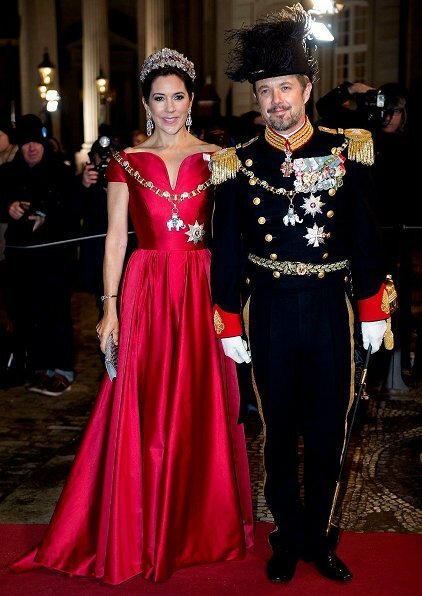 (Princess Mary wore a red dress designed by Danish fashion designer Soeren le Schmidt. 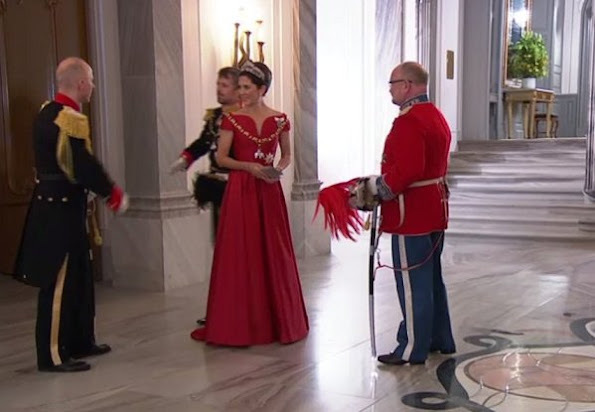 Princess Marie's dress is Rikke Gudnitz). Mary as Always looks stunning! Also she lookes very relaxed after her holiday in Tasmania! Wow,ladies looks incredible.Of course Mary wins, but Margarethe has beautiful colour and jewels and Marie shows one of her the most wonderful gown. Mary gorgeous as always. Marie can do better.the queen looks lovely. They all look gorgeous, especially Mary. But I do like Marie's glimmering golden dress, too. I love the last photo of Frederick and Mary--a happy natural moment in spite of the flashing lights. All three ladies look great. I like the sleeves on Marie's gown and I'm not usually one for three quarter sleeves. I also like the two tone effect where it looks golden in the interior photo. All beautiful. Mary's dress is unusual as she shows her shoulders, it usually becomes an 'etiquette error' at this solemn and official New Year's gala. But a very elegant dress! I think Marie has been seen in this dress at several official occasions or 'a look alike'! And always in the same tiara for 10 years! 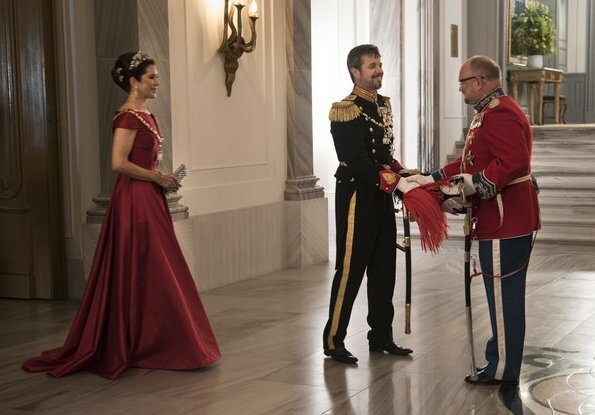 There is too much re-use in Marie's wardrobe at major official events, she represents a royal house, a monarchy, and the family gets apanage! 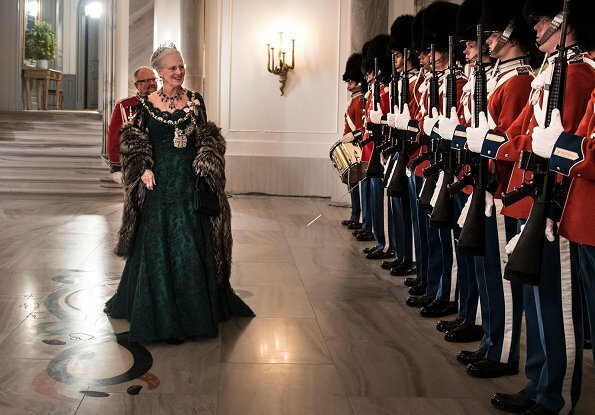 Queen Margrethe looks as usual regal at the New Year's event and this year she wears the magnifique emeralds and a dress in the same colour, spot on! She is short of tiaras, does not own any and can loan only two, this tiara here is one of them. The other one, Flora Danica must have some commercial problems (like Mary with Midnight Tiara), I have seen her wear it only once. Also Mary has had her Midnight tiara only three or four times during eight years. Mary a vraiment une allure royale. Distinction, grâce et élégance. En wat haar opvolger betreft: ga eens naar de kapper, bij voorkeur een barbier! Mary est tres belle et elegante! 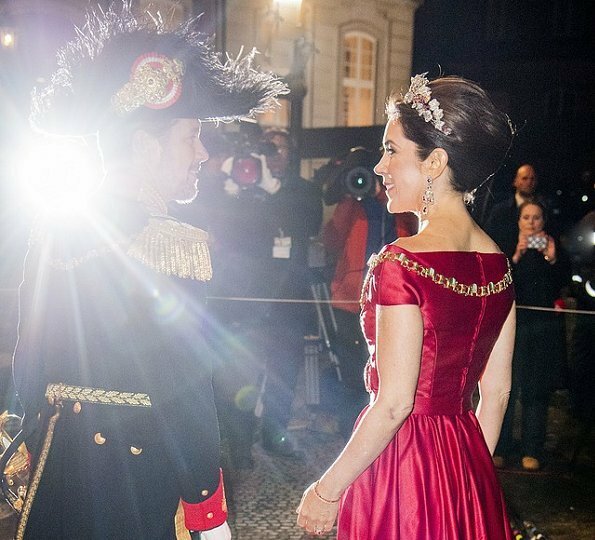 Princess Mary is gorgeous!! Love her in this gorgeous red gown!! The deep red suits her!! Happy New Year to you all!! Mary is the star of evening with this gorgeous red evening gown. She manages to balance her jewels and that order chain. 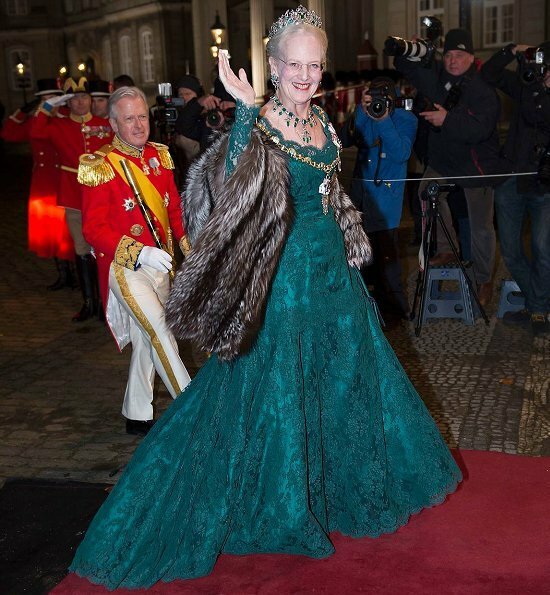 Margaretha looks like a christmas tree, too many jewels and every year this same green gown. Marie looks rather fresh and manages also well with order chain. About Marie´s tiara; she has basically two tiaras to wear, this floral tiara here and The Flora Danica Tiara. Both are only loans. 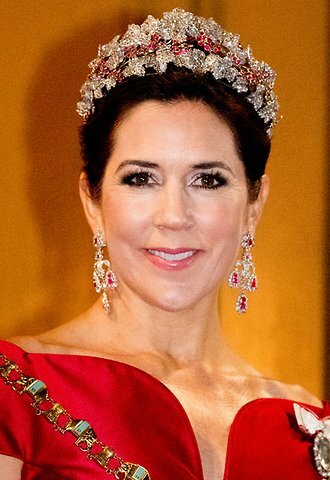 She does not own personally any tiaras (Mary owns her wedding tiara and the Edwardian one she bought herself, this ruby parure here is Frederick´s and goes to future crown prince after Mary´s use). The Floral Tiara belongs to Queen Margaretha and is permanent loan to Marie. (Joachim´s first wife got old heirloom tiara, Alexandrine Tiara as wedding gift as her own, what was mistake. She still has it after divorce and that is reason Marie got just a loan.) The other one, The Flora Danica was made especially to Marie but not to her own either but just for her to wear. I do not remember many times she had had that tiara. Queen Margaretha does not loan her tiaras to anybody (a few exeptions over years) so Marie has the same tiara in every tiara event. Is this for real?Dresses from 1700? I think that Marie is the best looking here. And the royal men then? Uniforms from a very old time and a lot of orders who seems to be from a swimming school? Come on.....it is a modern world now. The dress code for men in these tiara (=white tie) evenings is either a tails or uniform. This event has been traditionally uniform event. With uniform royal men wear their order medals, they come from orders they have been given mostly from foreign state visits. Order is basically a medal, a sash and sometimes star or chain. The collars they are all wearing belongs to the Order of the Elephant (highest order in Denmark). His stars are Order of the Dannebrog and Order of the Elephant. He has some military medals, naval, home guard and athletics. To get important foreign orders you need to be king, crown prince/princess (minor princes/princesses get other lower orders) or other ruler of your country. Also what are royal houses but centuries of extend. 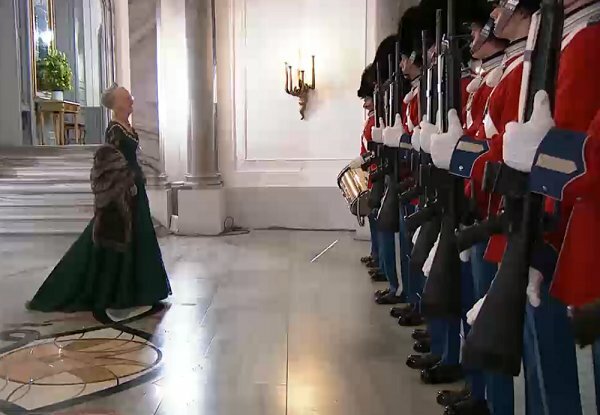 Danish royal house is the very oldest of Europe and one of the oldest of the world too, it comes straight from 13th century. Desiree Clary (wife of the first Bernadotte king of Sweden) had Mary´s ruby parure (not tiara in that state) at Napoleon Bonabarte´s coronation 1804. Emeralds of the Emerald Parure Queen is having here have belonged to Danish royal family since 1723. Parure it came 1840. There is raelly some substance to think about. What an odd comment. There's nothing from the 1700's here. Not one bit. Yes, it's a modern world, but there's nothing to say against upholding at least some traditions. The uniforms do have a meaning, and the orders, in particular the big gold collar as the most significant full gala part of the Order of the Elephant, are extremely precious. Photos like taken from a fairytale! It is a fairytale.....the word equally is not a high priority here! Sorry, charlotte Tanne, should you not like anything royal, why linger here making nasty comments? Oh dear Charlotte, haven´t you got your right swimming school medals? LOL Orders are almost always something to do with tittles, even minor ones. Also non royals who got these same orders than here get them because of tittle, being presidents, prime ministers etc. And they also get them at state visits. That is matter of courtesy. Minor home country ones you can get when you have done something very special to your own country. I quite enjoy Charlotte’s comments. Why shouldn’t she express herself in this blog? She simply made a comment about the uniforms and medals. To me, the men look like they are participating in a pantomime. The women’s clothes are lovely. I think Marie looks the best, I like this white and golden gown and I like her natural genuine smile, see photo No 7. Beth, we share the same opinion, for me is Marie the best looking here too - with beautiful gown and sincere smile. Wow! Mary looks magnificent! Gorgeous gown, colour and style and the jewels are perfection with this gown.